As we age, our faces begin to show the effects of gravity, sun exposure and years of facial wrinkles and movement. After years of muscle movement, the underlying tissues that keep our skin looking youthful and plump begin to break down, often leaving smile lines, laugh lines, crow’s feet or other facial creases. 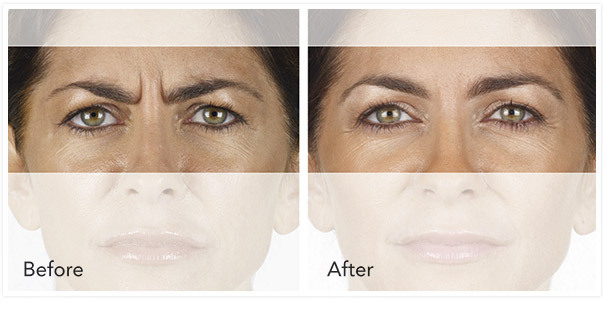 To help you look your best Baldone Reina Dermatology offers XEOMIN (zeo-min) a prescription neurotoxin medicine that is injected into muscles and used to treat forehead wrinkles, frown lines, and crow’s feet. Once injected under the skin, Xeomin causes facial muscles to relax, allowing the skin to flatten and fine lines and facial wrinkles to soften. *After shows 30 days after injection. Individual results may vary. Unretouched photos. The highest proportion of patients achieved treatment success (at least 2 points improvement in both the investigator and patient ratings) at Day 30.